Have you ever considered yourself to be avant-garde? You know, artsy-fartsy? If so, then today’s Nice Price or Crack Pipe Audi Avant will be right up your alley. That is, if its price doesn’t prove a to be artless. Do you ever equivocate by using the term “more or less?” We all do, right? With a claimed 246 horses at the rear wheels, and an $18,600 price tag, last Friday’s blown 2014 Scion FR-S handily offered up both more and less. That’s more power, and, compared to a newer Toyota 86, a lesser price tag. There was little equivocation in that equation ensuring that the Scion earned a 62-percent Nice Price win. What a lovely way to end the week. Actually a better way to wrap up the week that was would have been to attend Redwood 2, the Southern California car show feting the best—and admittedly, not best—cars of the ‘80s and ‘90s. A bunch of your humble Jalopnik crew was there, soaking it all up. I sadly, was unable to attend because I—and I kid you not—was required to attend a “Holiday Look-In” home tour.” Oh jeez, the things I do to keep peace in the family. If I had instead hit Radwood, my ride would have been my 1999 Audi A6 Avant. That would have been to the chagrin of my daughter, who has claimed the wagon as her beloved daily driver. 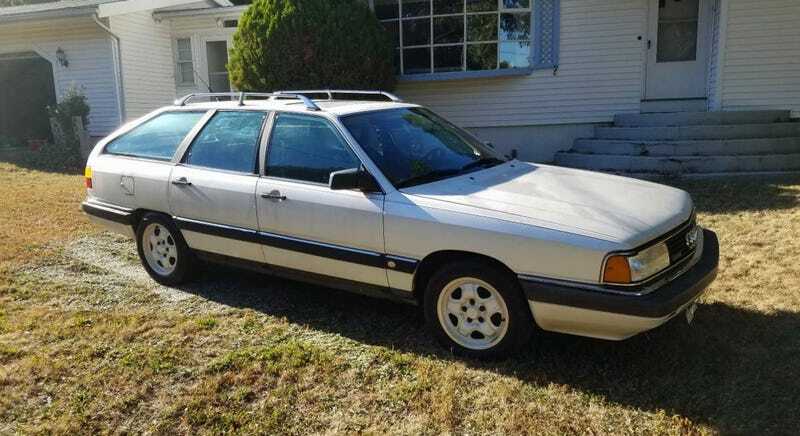 Perhaps an even more intriguing option for properly representing the last two decades of the 20th Century is this 1987 Audi 5000CS Turbo Quattro Avant. I mean, does it get any more ‘80s than a wagon at the cusp of the SUV era? For a long time Audi shuffled its nameplates here in America to ensure that each new model wouldn’t be tarred by the poor reputation of its predecessor. For its mid-level line that meant a panoply of 100s, 5000s, back to 100s—now adding 200s—and then finally single numeral 6 appended to the letter A, as with my A6. In the middle there came the 5000. This model was a tour de force in aerodynamics and weight management, all with the intention of doing as much as possible with the small engines that Audi had at their disposal at the time. Smooth lines and light weight (the jacks on these cars was made of aluminum to shave pounds) proved eventually not enough to keep up with the competition so Audi took to forced induction to add some oomph to their small gas engines. One result of that was the 5000CS which features a relatively diminutive 2,226-cc inline five cylinder imbued with 158 bhp by way of its intercooled turbo intake. Not only did Audi give the 5000 a hot snail, they also offered it with a five-speed stick, Quattro drivetrain, and made that all available in their unique and handsome Avant long roof body style. Sweet! This Avant is said to be just 300 miles out from a major engine overhaul and a clutch update. The seller claims the body to be excellent, however there are some questions I have regarding that claim based on the pictures provided. The car appears to come in either solid white or the next to impossible to match/blend pearlescent. There’s a big section on the off-side however, that looks like it’s been rattle canned. I don’t know if it’s just a trick of the light or if there’s really such a big difference in color at the B-pillar split, but it warrants an in-person review either way. There’s very little rust on the car, just some surface nastiness on one of the door sills and some dings in the leading edge of the hood. Aggressive five-spoke Fuchs wheels underpin, and most all of the trim here seems to be intact. The interior looks remarkably well preserved although it does show some wear and tear and a missing trim piece on the passenger door grab handle for its age. The dash is free of cracks and I just want to sit in one of those lovely leather seats and have a nap. That’s just how comfortable they appear. Also, I could use a nap. You’ll find Cadillac climate control in the dash, and GM seat switches on either of the front seats. An old school Audi AM/FM/Cassette head unit lays down the Bon Jovi. There’s also an extender on the clutch pedal—perhaps required by the present driver—that will most likely requiring removal before a test run. There’s only 131,000 miles on the Odometer, and just 300 since all that engine re-youthening, so it likely has some life left in it—maybe enough to make it to next year’s Radwood! How much? The asking is $3,000, and if you’ve been trolling old Avant ads like I have you’ll find that there’s no normal out there. Audi didn’t sell a lot of cars in the years following the 60 Minutes hack job, and of those they did sell here, many have gone the way of Elvis. This one happens to have some appreciably attractive qualities. Those are countered by what might be issues with the paint, and some minor rust, but those will need to be confirmed. What do you think, would you confirm this Avant to be a deal at that $3,000 price? Or, is this a Radwood contender, that’s not really all that rad? Hartford, CT Craigslist, or go here if the ad disappears. At $18,600, Could This Supercharged 2014 Scion FR-S Have You Ponying Up?